Take a bite out of fun by using this Monster Teeth. This classic item is perfect for using with a variety of costume ideas. 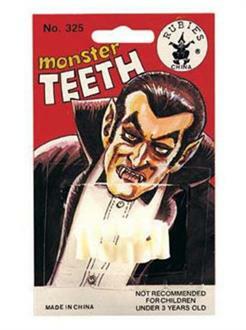 You receive a plastic set of teeth with fangs. Put it in your mouth and show off a devilish grin! There is even vintage style packaging for an authentic appearance. Have the Monster Teeth for vampire, werewolf, and other monstrous appearances. Check out some of our other fun costume props and accessories to use along with them!